Good oral health care is among the top things you can do for your pet to improve both the quality and length of your pet’s life expectancy. Because the mouth is constantly exposed to bacteria and germs. The first barrier against all these germs is being thoughtful about what we put in our mouths. The second barrier is our saliva. It's full of enzymes and has a pH that help destroy germs. Another barrier is related to genetics. Some people and some pets have less than ideal gums and enamel. This makes them more susceptible to bacterial invasion. But the most important barrier is having healthy gums. And we keep gums healthy through a combination of general robust health, oral hygiene care, and professional dental cleaning as needed. That's what this page is all about. # ONE place for germs to enter the blood stream is through puffy, red gums. And once bacteria and other germs get into the blood they can cause heart disease, kidney disease, joint disease, and any number of other serious health problems. One professor even said that if you added up all the diseases that occur from bacterial invasion through unhealthy periodontal tissue, you could rightly claim gum disease to be the number one cause of death.!!! That's why oral health is important. Adult dogs have 42 permanent teeth. 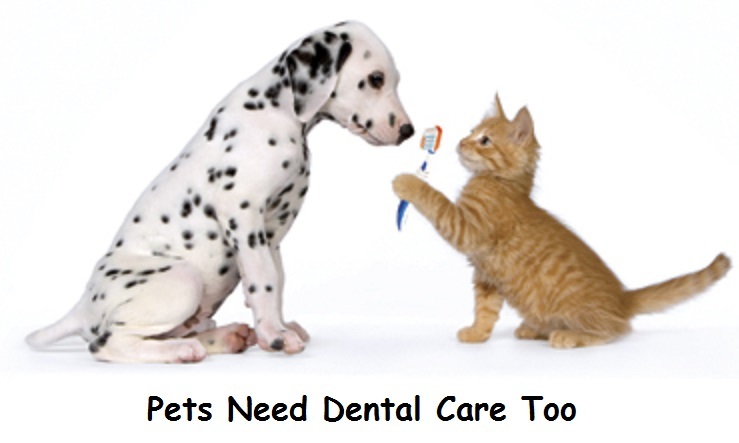 By age 3, 80% of dogs and 70% of cats show signs of oral disease, according to the American Veterinary Dental Society. One of the biggest health threats posed by periodontal disease is infection of the heart valves…one of the more common problems of older dogs and cats. In fact, a University of Minnesota – School of Public Health – found that gum disease is an early warning sign of cardiovascular disease. and The American Academy of Periodontology (www.perio.org). I went to a continuing education lecture recently about dentistry and the professor recommended that we should get a special x ray machine for doing dental radiographs. This might be ideal but I would have to charge an additional $75 per dental patient in order to pay for the machine and all the government required inspections, paper work and so forth. Most practices offer dental cleaning and polishing services…but these are often offered too late…after the bone substructure is already permanently damaged. We carefully look at the gums and teeth of all our exam patients and I personally feel that we catch dental problems in our regular patients in plenty of time to keep their oral health in good condition. I don't have anything against idealists with progressive ideas, but it seems a little silly to me to worry about finding decay so minor it's not apparent on a good exam when I often have trouble convincing people to spend the money for dentistry when it's obvious the poor pet has heavy tarter, red, raw gums, and putrid breath. But what is important for sure is that we keep our pet's teeth reasonably clean and even more important is to keep their gums as healthy as possible. Dental cleaning under anesthesia is the best way to do this when your pet has significant tarter and/or gum disease. Using CET brushless gel on a daily basis and/or our TD or Tartar control treats are additional good ways to keep your pets gums and teeth healthy between cleanings. Check In: We usually ask you to drop your pet off at the scheduled time on an empty stomach. That means no solid food for at least 8 hours prior to anesthesia. We will spend a little time with you making sure all our ducks are in a row, that we're both clear on everything, make sure all your contact information is up to date, go over some pre-anesthetic and anesthetic choices, and sign off on the consent forms. Consent Form: Anesthesia is needed in veterinary dentistry and anesthesia is serious business. A responsible adult will be asked to sign a consent form designed to inform you that of course there are some risks and expenses involved. It would be great if you would print this out and bring it with you if your pet is coming in for dentistry soon. Note: someone asked me recently why anesthesia was needed to clean teeth on pets. After all, groomers sometimes scrape off a pet's tarter without anesthesia. There are several reasons, but here's two: Even if a pet would tolerate professional cleaning without anesthesia, there is usually a lot more involved than just scraping off visible tarter. The main battle for oral health is UNDER THE GUMS (periodontal disease) and very few pets would tolerate ultra sound cleaning, periodontal inspection, or extractions. Pre-anesthetic exam to make sure your pet is healthy prior to surgery. Lab Choice # 1: to make sure we don't lose a patient to some of the more common dangers whenever anesthesia is involved, we should at least screen for kidney disease, liver disease, diabetes, and anemia. The cost is $32 for these 4 tests. We will probably insist on this higher level of testing if your pet is older, sickly, malnourished, or a high risk breed. Or if the dentistry is likely to be long or complicated. Or if potent medications are likely to be needed afterwards. Choice # 3: You can decline doing any lab work if you must save the money. And if your pet is young and healthy, the vast majority of pets have no complications. But anesthesia and dentistry are both serious procedures and occasionally deadly when things go wrong. This is what I recommend and use on the majority of young, healthy pets having a routine, prophylactic dental procedure... especially if the blood work comes up clean. The cost is $60 for most patients. Anesthesia Choice # 2: Isoflorane GAS Anesthesia. A little more expensive ($90 for most patients), but safer for old or high risk patients, long procedures, and complicated procedures. It also results in a more rapid recovery. Pre-Anesthetic sedation, induction medications, an open iv line, EKG, electronic monitoring of vital signs, & oxygen therapy are all included with this choice. Fluid therapy is usually NOT needed in healthy patients having uncomplicated dentistry. However, IV Fluids should be given if your pet is quite old, if the dentistry is going to be long or involve extensive gum surgery. Or if there's any hint of a compromised liver or kidney on the blood work. Dentistry, especially if extractions or gum surgery in involved, can be very stressful and exhausting to the body and even though most procedures are relatively painless thanks to modern anesthesia and pain management, the body is still sending out a general alarm to the immune system that it's being invaded. Once the immune system is triggered all kinds of chemical, electrolyte, and other biological changes take place. IV Fluids help maintain core body temperature, flushes out and preserves the kidneys, helps us control electrolyte imbalances, and speeds recovery. And in the event of an anesthetic (cardiac or respiratory arrest) emergency, we have instant access for emergency medications if there is an open IV line. Pre-anesthetic sedation, induction, morphine pain management, anti-emetic (nausea) meds, atropine, antibiotics, & other medications may be needed depending on the case. These will be given as appropriate by your veterinarian. A lot of the these things are included as part of the anesthetic fees, but other things ... like antibiotics... are charged separately in range in cost from just a few dollars to $40. Basically, veterinary dentistry is the same as what happens to you when you go to the dentist for a prophylactic cleaning and inspection EXCEPT that our patients are under anesthesia. A well trained and meticulous dental tech will spend about 45 minutes cleaning, polishing, and probing every tooth. Then a veterinarian will inspect the entire oral cavity for possible disease, and then do whatever's needed in terms of extractions, gum surgery, or tooth repair. Then the dental tech will finish cleaning up the mouth, apply sealants, and use the laser which reduces post dental inflammation and speeds healing of the gums. Minor Surgery Add Ons: if you want other things done while your pet is under anesthesia such as nail trimming, removal of warts, moles, small masses, or dewclaws, just let us know. The fee for doing these types of things are either minimal or done at no charge. Morphine or other pain medications will probably be given during recovery... especially if extractions were involved. This will cost a few dollars. Antibiotics: If your pet's gums are badly infected or if we extracted an abscessed tooth, we are likely to send home 7-10 days of oral antibiotics. I usually dispense Clindamycin which is effective and quite inexpensive. Or for cats I usually give the new Convenia antibiotic injection that lasts for 14 days so you won't have to "pill" your cat. Unfortunately, this injection is quite expensive; about $35-45 depending on the size of your cat (or small dog). We also have inexpensive Clindamycin available in a children's flavored liquid for cats and small dogs. But it can still be a bit of bother getting it down cats. Biotene Gel: Same active ingredients as the human version. This is an antiseptic and soothing gel for those pets with ulcerative gums, other gum lesions, oral tumors, erosions, and other serious mouth lesions. CET Oral Hygiene Brushless Gel: I really like this product as an alternative to brushing your pet's teeth. No brushing! And it works almost as well at keeping tarter at bay and gums healthy. However, it still requires a willing pet and a willing owner. But all you have to do is squirt a little in the mouth or dab a little somewhere on the teeth or gums. The tongue will do the rest of the work. Chewies: Greenies, chew bones, and other brands and types of chews designed to aid in oral health are all helpful. Hill's, as usual, makes an excellent diet designed for pets with chronic dental disease, soft gums, and so forth. It's called Hill's T/D (Tarter Diet). It's a very high quality, low fat, low calorie nugget with floss like fibers throughout the nugget designed to keep teeth clean. It helps a lot. We dispense a lot of this diet to be used as treats. We'll be glad to give your pet a free sample. Post Dental Follow ups are not often needed. But if your pet has any bad mouth odors, tenderness, or other obvious or suspected problems after a few days, don't be shy. Let us know. There's no charge to recheck anything we do at our Hospital. Thanks for reading. If your bringing your pet in for dentistry, please read, print out and bring in the dental consent form. Click here to go to our page discussing the Dental Products we have that help keep your pet's mouth healthy. Click here to go to our page about our laboratory or our page about help with interpreting lab results.